The ciliary hypothesis for cystic renal diseases postulates that most of these conditions result from abnormalities in the primary cilium, a microtubule-based structure that acts as a sensor for extracellular cues. Inactivation of the von Hippel-Lindau (VHL) tumor suppressor gene predisposes to renal cysts and clear cell renal cell carcinoma. VHL plays a critical role in the formation of primary cilia in kidney epithelium, but the underlying mechanisms are poorly understood. Here, we demonstrate that VHL inactivation induces HEF1/Cas-L/NEDD9 and Aurora kinase A via the stabilization of hypoxia-inducible factors 1 and 2. Aurora kinase A is a mitotic kinase commonly upregulated in cancer that causes regression of the primary cilium by promoting histone deacetylase-dependent tubulin depolymerization of the ciliary axoneme. HEF1/Cas-L/NEDD9 is a component of focal adhesions that has a prominent role in inducing metastasis and that colocalizes with Aurora kinase A at the centrosome, thereby enhancing the harmful effect of Aurora kinase A on the cilium. Suppression of this pathway improved the formation of primary cilia and reduced cell motility in VHL-defective renal cancer cells. Our results highlight the gatekeeper role of VHL in the kidney epithelium. The most studied function of VHL protein (pVHL) is the regulation of cellular responses to altered oxygenation through controlling the degradation of the α subunits of the transcription factor hypoxia inducible factor (HIF).8 In the presence of oxygen, HIF-α subunits are hydroxylated by the HIF prolyl hydroxylases,9 and this generates a binding site for pVHL. Under hypoxia or when pVHL is inactivated, stabilized HIF translocates to the nucleus, binds HIF-β, and induces many genes.6,8 pVHL has additional HIF-unrelated functions such as controlling extracellular matrix assembly.10 We and others have also reported that pVHL regulates primary cilia through both HIF-dependent and -independent mechanisms.11–14 Better understanding of how pVHL exerts this role may provide ways to prevent or cure CCRCCs. Here we hypothesized that activation of the NEDD9–AurkA pathway may underlie an HIF-negative effect on the cilium in VHL-defective CCRCC cells. Supporting this idea, AurkA is a HIF-1α target15 and is up-regulated in CCRCCs,16 although an association with VHL status had not yet been established. Moreover, NEDD9 was originally termed renal carcinoma antigen NY-REN-1,17 and previous studies showed that NEDD9 mRNA is induced by hypoxia in CD133+ cells18 and by pVHL inactivation in CCRCC cells.19 To test this, we generated pools of the VHL-defective CCRCC cell line RCC10 that overexpress the longer isoform of pVHL (pVHL30) or control empty vector. Re-expression of VHL reduced HIF, NEDD9, and AurkA, as analyzed by Western blotting and real-time RT-PCR (qPCR; Figure 1, A and B). The well-known HIF-α target VEGF and the VHL-regulated tight junction protein claudin 120 were used as qPCR controls. Both isoform 1 and 2 of NEDD9 were down-regulated by pVHL at the mRNA level, but the closely related p130CAS showed no differential effect (Figure 1C). Regulation of NEDD9/AurkA by pVHL was additionally shown by immunofluorescence in RCC10 cells (Figure 1D) and by Western blotting and qPCR in RCC4 cells (Figure 1E). Western blotting of paired tumor and normal tissue samples from patients with VHL-defective sporadic CCRCC further confirmed these observations (Figure 1F). We studied whether activation of NEDD9 and AurkA in VHL-defective RCC10 cells was HIF mediated. We overexpressed a series of previously reported disease-associated pVHL mutants that retain different abilities to down-regulate HIF.6,21 The shorter isoform of pVHL (pVHL19), which has the ability to down-regulate HIF but lacks other functions associated to pVHL30,22 was used as an additional control. Type 2C pVHL variants are associated with high risk of pheochromocytoma in vivo but no other manifestations, whereas type 1 and 2B pVHL variants associate with renal manifestations.6 Type 2C mutants effectively down-regulated HIF-α subunits, NEDD9 and AurkA, but types 1 and 2B did not (Figure 2A). Next we transfected VHL-defective RCC10 cells with small interfering RNA (siRNA) oligos for HIF-1α and/or HIF-2α and observed that AurkA is regulated by both HIF-α subunits, whereas NEDD9 is regulated only by HIF-2α (Figure 2B; Supplementary Figure 1); siRNA oligos against the firefly luciferase gene were the control. HIF-2α and NEDD9 were up-regulated by HIF-1α siRNA. HIF-2α siRNA also moderately increased HIF-1α, consistent with previous reports showing that HIF-α subunits influence each other.23 The regulatory effect of HIF-2α on NEDD9 and AurkA was verified overexpressing a constitutively stable HIF-2α that bears mutations in the proline residues hydroxylated by the HIF prolyl hydroxylases24,25 (Figure 2C). Moreover, of four putative hypoxia responsive elements in the NEDD9 proximal promoter, chromatin immunoprecipitation (ChIP) showed specific binding of HIF-2α to region 4 (−633 to 628 upstream of the transcription initiation; Figure 2D). This was validated by cotransfection of a constitutively stable HIF-2α and a luciferase reporter plasmid containing the NEDD9 promoter with or without a mutation (GCGTG to GTTTG) in this hypoxia responsive element (Figure 2E). Inactivation of VHL induces NEDD9 and AurkA in CCRCC cells. (A) Western blot using the indicated antibodies and lysates from two different pools of VHL-defective RCC10 cells infected with a retrovirus producing pVHL30 or control empty vector. Tubulin was used as loading control (also hereafter). (B) qPCR for the indicated targets in the same RCC10 pools; mean values of three independent experiments and the SD are shown (this applies hereafter to all data containing error bars). *P < 0.05 as analyzed by t test (also applies hereafter). (C) qPCR for NEDD9 isoforms 1 and 2 and the NEDD9-related molecule p130CAS in the same RCC10 pools. (D) Left: immunofluorescence photographs of VHL-defective RCC10 pools infected with empty vector or VHL30 and labeled for AurkA. Magnified images of the same field (only for VHL-defective cells) show AurkA staining cells at different stages of the cell cycle. Scale bars correspond to 10 μm. Right: quantification of AurkA positive cells in three immunofluorescence experiments (performed in triplicate and counting 10 fields on each coverslip) in VHL-defective RCC10 pools infected with retroviruses producing pVHL30 or empty vector. **P < 0.01 (also hereafter). (E) Western blot using the indicated antibodies (left) and qPCR for the indicated genes (right); two different pools of VHL-defective RCC4 cells were infected as above. (F) Western blot using the indicated antibodies and lysates from paired CCRCC tumor samples and surrounding normal tissue of two patients with VHL-defective sporadic CCRCC. 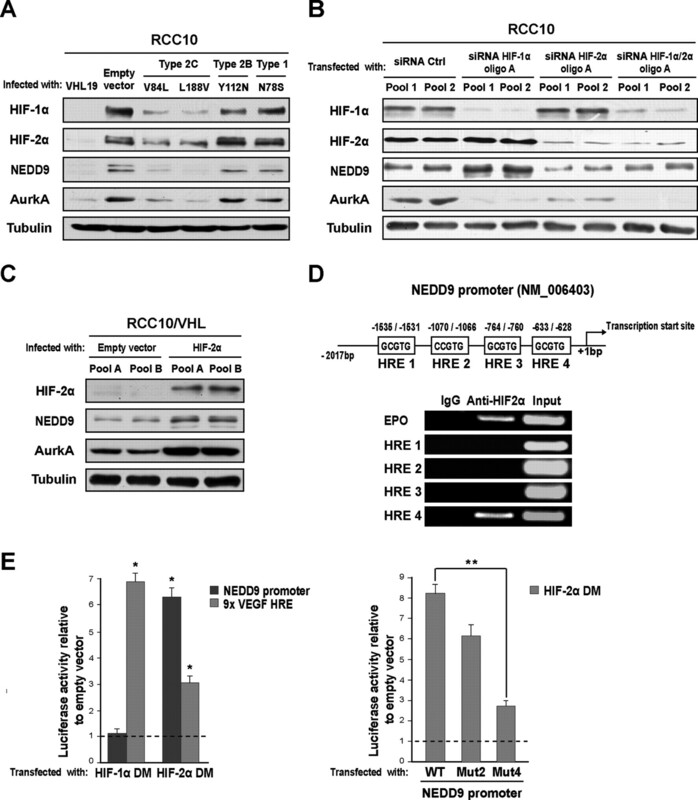 Stabilization of HIF mediates the induction of NEDD9 and AurkA in VHL-defective RCC10 cells. (A) Western blot using the indicated antibodies and lysates from VHL-defective RCC10 pools infected with retroviruses producing pVHL19, disease specific-pVHL mutants, or empty vector. (B) Western blot using the indicated antibodies and lysates from VHL-defective RCC10 cells transfected with siRNA oligos (oligo pairs A, see Supplementary Methods) for HIF-1α, HIF-2α, and the firefly luciferase gene (control); two different pools were transfected in parallel. Ctrl indicates control (also hereafter). (C) Western blot using the indicated antibodies and lysates from two different pools of an RCC10 cell clone stably expressing VHL25 (RCC10/VHL) infected with retroviruses producing a constitutively stable form of HIF-2α or empty vector. (D) Top: schematic representation of putative hypoxia responsive element sites in the proximal NEDD9 promoter. Bottom: semiquantitative RT-PCR with ChIP samples obtained using HIF-2α or control antibodies; diluted chromatin (1:10) was used for the input. (E) Left: activity of the same promoter cloned upstream of the luciferase gene into pGL3Basic and cotransfected into HEK293T cells together with empty pcDNA3 vector or constitutively stable forms of HIF-1α (HIF-1α DM) and HIF-2α (HIF-2α DM). Right: activity of the same promoter containing mutations in the indicated putative hypoxia responsive element sites and cotransfected in HEK293T cells with empty pcDNA3 vector or a constitutively stable HIF-2α. WT, wild type; MUT, mutated. GCGTG sites were mutated to GTTTG using site-directed mutagenesis. We evaluated the contribution of NEDD9 and AurkA to primary cilia abnormalities in RCC10 cells. 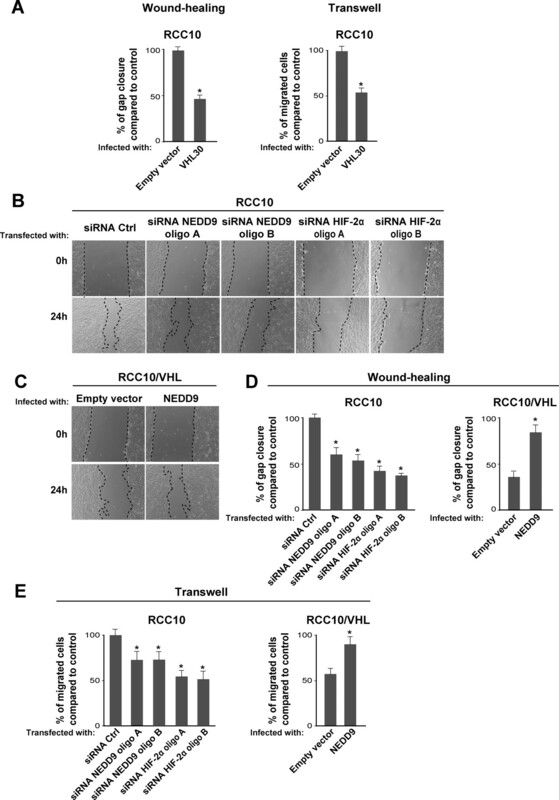 Overexpression of NEDD9 or AurkA reduced cilia formation in VHL-defective RCC10 cells stably transfected with VHL (RCC10/VHL) (Figure 3, A and B); increased expression of NEDD9 and AurkA was verified by Western blotting. Conversely, two small molecule AurkA inhibitors or the HDAC inhibitor trichostatin (TSA) increased the number of cilia in VHL-defective RCC10 cells compared with the control (Figure 3, A and B). siRNA for NEDD9 effectively increased cilia formation in VHL-defective RCC10 cells as well (Figure 3C), and the combined knock down of both HIF-α subunits was more effective than HIF-1α alone (Figure 3C). This cooperative effect highlights a role for HIF-2α without contradicting our previous findings that VHL inactivation alters cilia mainly through HIF-1α.11 The fact that HIF-2α siRNA alone has no effect on ciliogenesis may be explained by the incomplete reduction of NEDD9 expression compared with NEDD9 siRNA (Figures 2B and 3C; Supplementary Figure 1). The latter may imply that additional mechanisms regulate NEDD9 in VHL-defective cells, but it could also be a threshold effect. Besides, it is possible that up-regulation of HIF-1α triggered by HIF-2α counteracts cilia formation indirectly. Notably, under the conditions tested, we did not detect any change in cell proliferation after overexpression of NEDD9/AurkA or treatment with inhibitors and siRNA oligos (Supplementary Figure 2, A–C), reinforcing the idea that NEDD9/AurkA affect ciliogenesis independently of cell mitosis.3 Additionally, because NEDD9 is also an important regulator of cell motility, we studied whether manipulating its expression would influence the motility of RCC10 cells. As reported for other CCRCC cell lines,26 VHL-defective RCC10 cells expressing pVHL30 were less motile than the control, which we assessed using wound healing and Transwell assays (Figure 4A). We then observed that overexpressing NEDD9 increased the motility of VHL-defective RCC10 expressing pVHL30 and knock down of NEDD9 or HIF-2α reduced the motility of VHL-defective RCC10 expressing the empty vector (Figure 4, B–E). The effects on cell motility seemed independent of cell proliferation as well (Supplementary Figure 2D). Manipulation of the NEDD9-AurkA pathway influences primary cilia formation in VHL-defective RCC10 cells. (A) Left: Western blot showing increased expression of AurkA and NEDD9 in RCC10/VHL cells infected with AurkA and NEDD9 respectively. Right: quantification of primary cilia in RCC10/VHL cells overexpressing AurkA, NEDD9, or both, and in VHL-defective RCC10 cells treated for 72 hours with VX680 (250 nM), ZM447439 (2.5 μM), or TSA (100 nM). (B) Immunofluorescence photographs of VHL-defective RCC10 or RCC10/VHL cells infected or treated as indicated; scale bar corresponds to 10 μm. Values correspond to three independent experiments done in duplicate—16 fields were counted in each coverslip; this applies hereafter to all related experiments. (C) Left: Western blot using lysates from VHL-defective RCC10 cells transiently transfected with siRNA oligos for NEDD9 or control. Right: quantification of primary cilia in VHL-defective RCC10 cells transfected with siRNA for HIF-1α (100 nM), HIF-2α (100 nM), HIF-1α (50 nM) + HIF-2α (50 nM), and NEDD9 (100 nM) compared with control (100 nM). 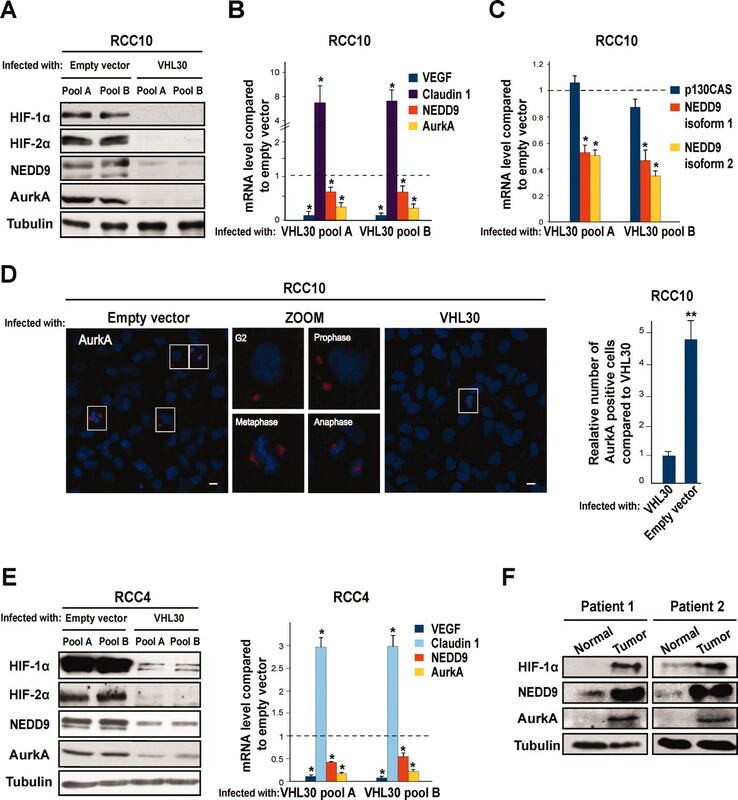 NEDD9-AurkA regulate motility in VHL-defective RCC10 cells. (A) Left: quantification of gap closure in three independent experiments (measured in triplicate) after wounding monolayers of VHL-defective RCC10 cells (infected with VHL30 or empty vector) with a tip edge (cells were washed and fresh medium added afterward). Right: cell migration through Transwell filters using similar RCC10 cell populations. (B) Selected phase contrast photographs of a similar experiment using VHL-defective RCC10 cells treated as indicated. (C) Same as in B but using RCC10/VHL cells infected with NEDD9 or empty vector. (D) Quantification of three independent experiments as in B and C measured in triplicate. (E) Quantification of cell migration through Transwell filters (three experiments in triplicate) using VHL-defective RCC10 cells or RCC10/VHL cells transfected and infected as indicated. In summary, our data show that the NEDD9–AurkA pathway is induced through HIF in CCRCC cells and has significant impact on two relevant features of VHL-defective cells: the suppression of primary cilia that in vivo can lead to premalignant cysts and the increased motility that can lead to metastasis. This supports the idea that AurkA and HDAC inhibitors may be useful in treating sporadic CCRCC and VHL disease. Indeed, AurkA is a promising therapeutic target in cancer in general,27 and TSA is already used in the clinic for unrelated malignancies.28 Our findings may also have broader implications, because activation of HIF is common in cancer because of oncogenic signaling or abnormal oxygenation.8 This could explain why, in some contexts, cancer cells lose primary cilia or metastasize. Notably, the pollutant-responsive transcription factor, aryl hydrocarbon receptor, which like HIF dimerizes with HIF-βs (also termed ARNT), also increases NEDD9 expression.29 While our work was under review, Dubois and collaborators30 reported that HIF-α can induce NEDD9 in colon cancer cells. In the future, it will be interesting to determine whether other mechanisms known to affect ciliogenesis are regulated by VHL in a HIF-dependent or -independent manner. VHL-defective RCC10 and RCC4 CCRCC lines and RCC10/VHL (clone 90) were reported previously.11 Experimental tissue culture conditions are described in the Supplementary Information. Retroviral infections were performed as described25 but using HEK293T and a complementary packaging vector (pCL) for viral production. pBABE retroviral vectors expressing human NEDD9 (isoform 1, NM_006403.3) and AurkA (isoform 1, NM_198433.1) were prepared using cDNA from VHL-defective RCC10 cells as a template and confirmed by sequencing. Other retroviral vectors including constitutively stable versions of HIF-1α (carrying mutations at prolines 402 and 564) and HIF-2α (prolines 405 and 531) have been described before.11 AurkA inhibitors ZM447439 and VX680 were purchased from Tocris Bioscience and Kava Tech, respectively, and diluted in DMSO; TSA was purchased from Sigma and also diluted in DMSO. Uncoated Transwell filters were purchased from Millipore; cell migration (4 × 105 cells were added in the top chamber) was allowed to proceed for 2 hours before fixing cells with methanol and cleaning the upper chamber. Monoclonal anti-NEDD9 was purchased from Abcam, rabbit polyclonal anti-HIF1α and anti-HIF2α was purchased from BD Biosciences and Novus Biologicals, respectively, rabbit polyclonal anti-AurkA was purchased from Cell Signaling, and mouse monoclonal anti-acetylated tubulin was purchased from Sigma. Immunofluorescence studies were performed as described,25 and a Leica TCS SP2 Spectral Confocal System microscope was used for detection. Western blotting was performed using ECL Plus (Amersham). siRNA oligos for HIF-1α, HIF-2α, and NEDD9 are described in the Supplementary Information. All siRNA oligos were purchased from Guangzhou Ribobio. Cells were transfected using LipofectAMINE 2000 (Invitrogen) and a reverse transfection protocol as indicated by the manufacturer. qPCR was performed using SYBR Green (Takara) and an ABI7300 machine. Samples were measured in triplicate and normalized on the basis of β-actin values. For ChIP, we followed the X-ChIP protocol from Abcam; ChIP grade anti-HIF-2α was also from Abcam. qPCR and ChIP primer sequences are listed in the Supplementary Information. This work was supported by Chinese Academy of Sciences Grant KSCX2-YW-R-244 and start up funding from the Guangzhou Institutes of Biomedicine and Health to M.A.E. J.X. and H.L. contributed equally to this work.